Image caption Niamh Houston, aka Chipzel, is part of the team nominated for the award. A Strabane woman is celebrating after being nominated for an award at the British Academy Games Awards. 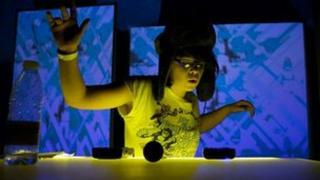 Niamh Houston, whose stage name is Chipzel, has been nominated as part of the team behind the game Super Hexagons. Super Hexagons has been nominated in the Best British Game category at the awards which take place on 5 March. The awards are organised by the British Academy of Film and Television Awards (BAFTA). Niamh has been nominated alongside fellow designers Terry Cavanagh and Jenn Frank. She was approached by Terry Cavanagh and asked if he could use her music in the game. "I create my music using old Nintendo gameboys to make the sound," she said. Niamh is now studying music production at John Moores university in Liverpool. "I'm really looking forward to the award ceremony in London," she said. "It's going to be really exciting and a great opportunity." Super Hexagon has been downloaded more than 50,000 times on the App Store. They are competing against the teams who created Dear Esther, Forza Horizon, Lego: The Lord of the Rings, Need for Speed Most Wanted and The Room.